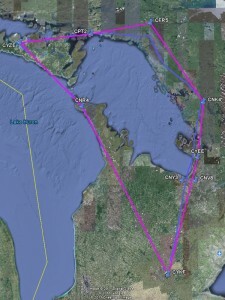 Our planned course (magenta) and actual track (blue). I like to go on at least one all-day flight every year, although I haven’t managed to do so since 2006 (unless you count my half-day trip to the Edenvale Gathering of the Classics, which turned into a whole day due to a mechanical issue). 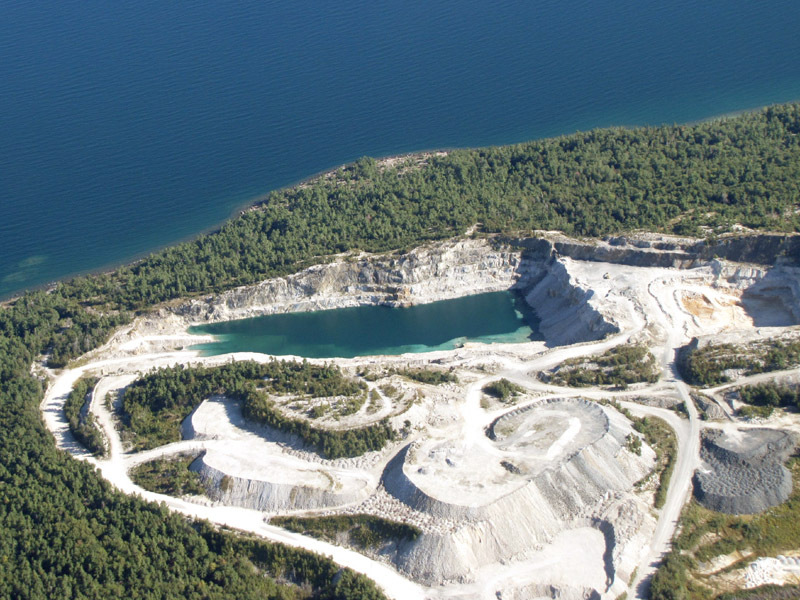 I’ve actually only made three full-day trips in the past: Sault Ste. 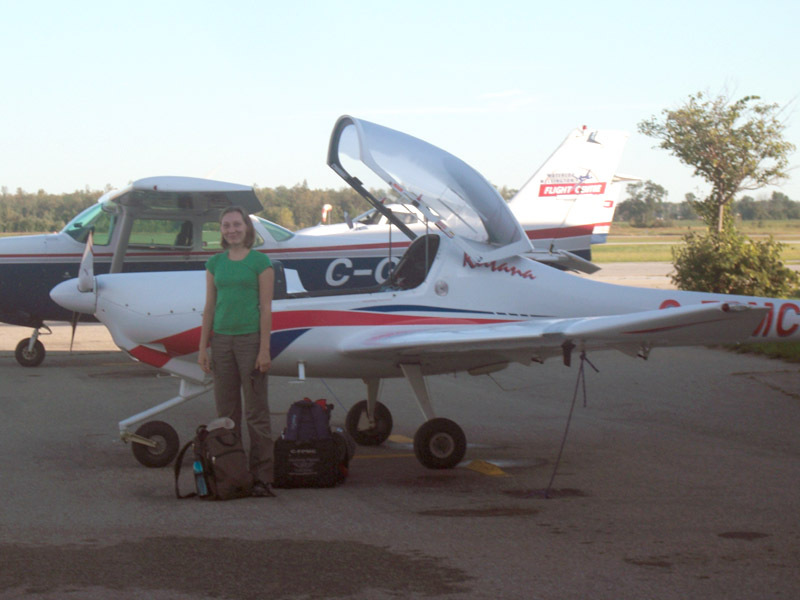 Marie in 2003, Killarney in 2005 with a co-worker, and the Canadian Aviation Expo in Oshawa (via Barrie to pick up a friend) in 2006. Elena and all of our gear, prior to boarding. 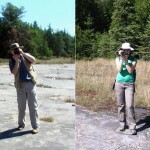 I decided it was time for another expedition this year, and invited my friend and co-worker Elena to come along. 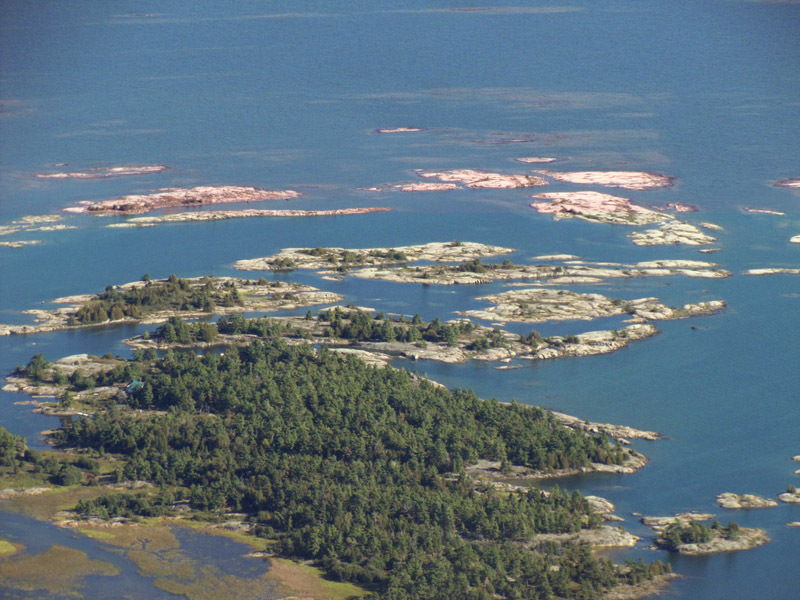 After considering a few options, we decided to fly to Gore Bay Airport on Manitoulin Island, and go hiking at the Misery Bay Provincial Nature Reserve. We got a pretty early start, arriving at the airport at about 8:00am on Saturday September 10th. I’d completed all the flight planning the night before, and the winds-aloft forecast had not changed, so filing the flight plan went quickly. We did have to wait a while for fuel, so our 9:45am planned departure became 10:15am. 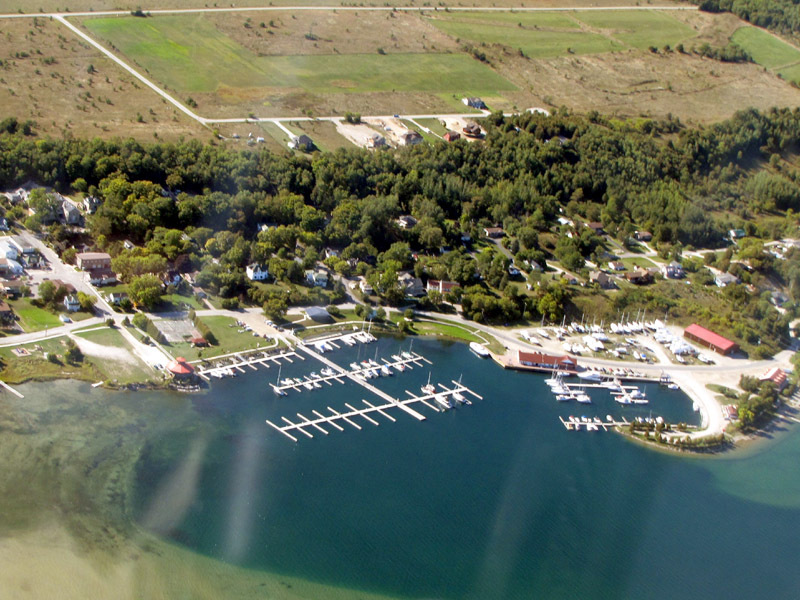 Flying up the Bruce Peninsula. We had a fair bit of baggage: two knapsacks, my flight bag, the plane’s flight bag, one inflatable life vest, and a wilderness survival kit. This all added up to the maximum 40lb allowed in the Diamond Katana‘s baggage area. Added together with the two of us and a full tank of fuel, we were at 1570lb, comfortably below the maximum take-off weight of 1609lb. 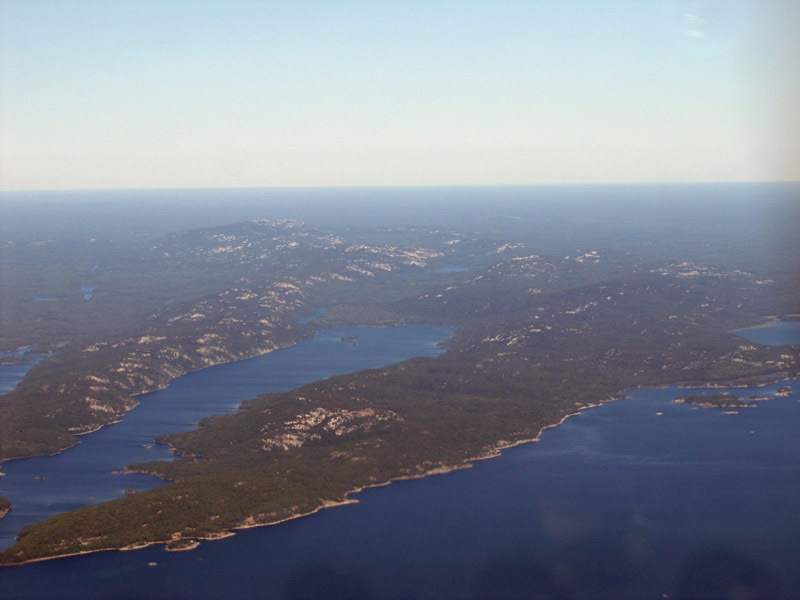 Our route to the island was NNW at 4500′ up the Bruce Peninsula to Tobermory, and NW at 6500′ from there before starting our descent into the Gore Bay Airport. The higher altitude during the second leg was to allow for a safe glide to shore in the unlikely event of an engine failure over the water. The weather was absolutely perfect the whole way, with smooth air and not a cloud in sight. We crossed over the Gore Bay Airport at about 11:00am, entered the left hand downwind for runway 11, and made an uneventful landing. After taxiing to the terminal building, we were greeted by name by airport manager Robert Colwell, whom I had corresponded with in the weeks before. 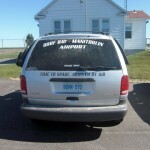 We refueled, tied the plane down, and set off for Misery Bay in the airport’s courtesy van (a benefit of being a small-plane pilot is that many small airports will lend you a vehicle for a short time for free, although it is customary to leave a donation to pay for its fuel and upkeep). When we arrived, we had a brief altercation with the ticket machine, which insisted that we pay $2 for a pass into the park, cheerfully took our money, but didn’t print a ticket because it appeared to be out of paper. 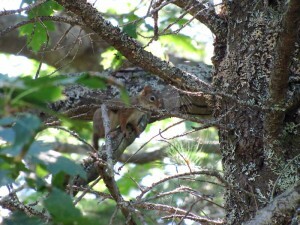 We then hiked to the visitor centre (now closed for the season), and had lunch on the deck overlooking the forest. 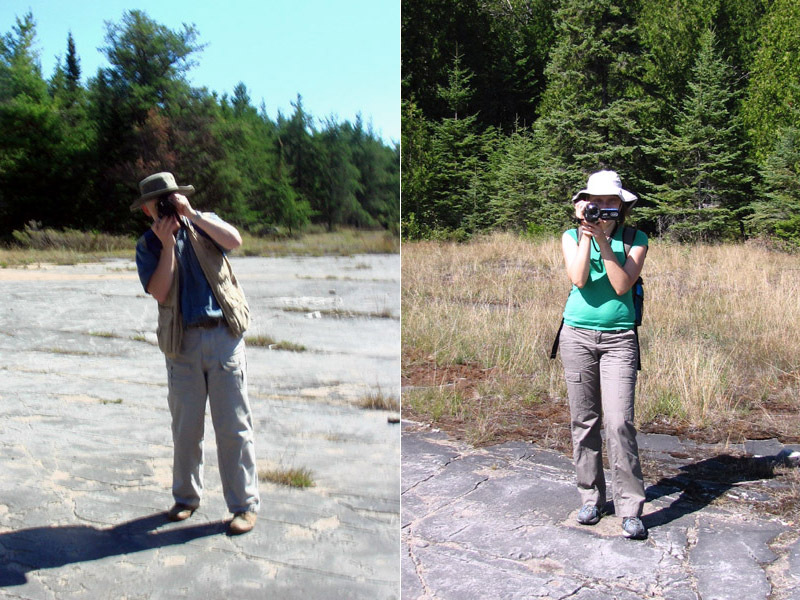 The Arrogant Worms have described Canada as a land of “Rocks and trees, And trees and rocks, … And water.“, which is certainly true of Northern Ontario, but walking through the forest, there was much more to see than that description would suggest. The forest floor was alive with mosses, lichens, grasses, ferns, and other plants. Fallen leaves and needles filled in the rest of the space. 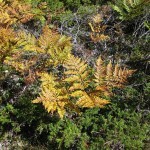 As it was already the beginning of fall, some plants were already changing their colour. 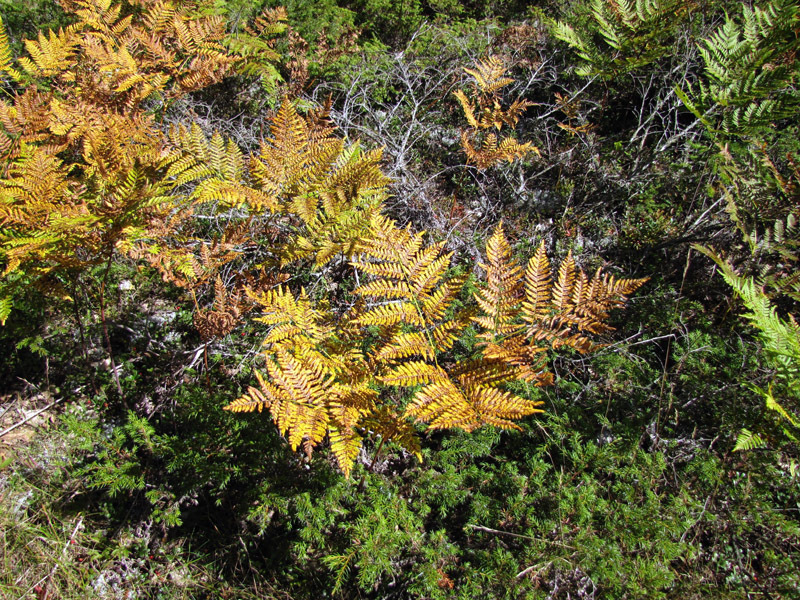 Ferns, normally bright green in colour, were now yellow, making quite a contrast with the evergreen seedlings scattered among them. We didn’t see a lot of animal life other than a few birds, a snake which got away before we could photograph it, and some chipmunks playing in the trees while getting ready for winter. They paved paradise and put up a parking lot? No, this is naturally occurring alvar. The obligatory time-stamp synchronization shot. Up close, the alvar looks like badly maintained pavement. Where the alvar reaches the shore, it continues under the water. Although we didn’t try, it looked as if we could have walked 50 metres out into the water and only gotten our feet wet. At first glance, the alvar looks like an old, poorly-maintained paved parking lot. 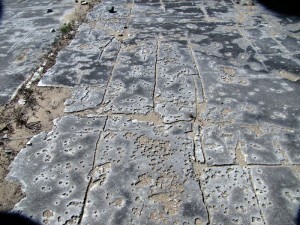 It is dark grey or black in colour and almost perfectly flat, but is pock marked with small holes and cracks. 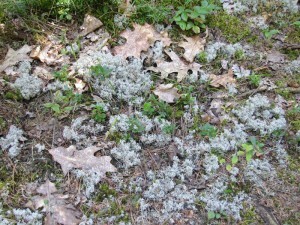 In some areas, especially near the water, small plants grow from from every crevice that has accumulated a bit of soil. I find it amazing at times how adaptable tenacious some forms of life can be. We eventually came to the end of the trail we had selected, where the map showed a small cabin. We found the cabin, and while sitting on the rocks outside for a rest, looked up and saw what at first seemed like a flock of white birds. 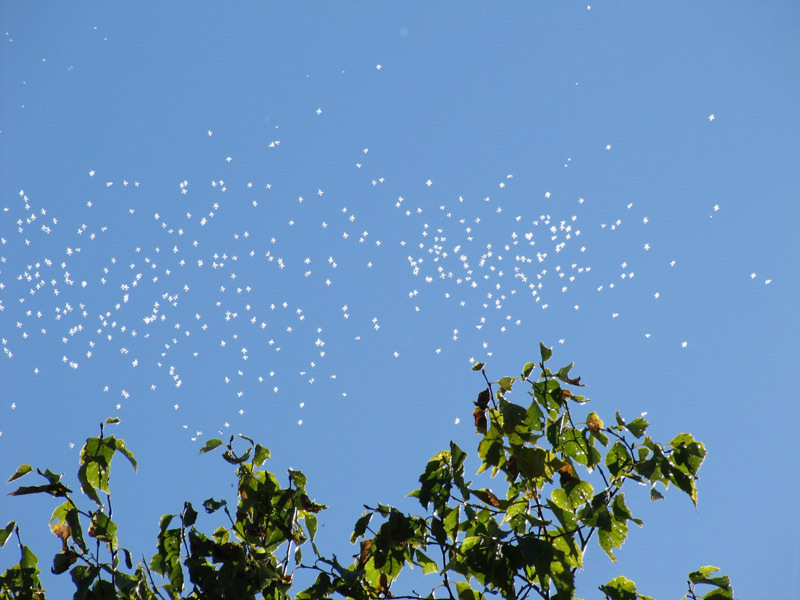 Watching for a few seconds, it became apparent that the “birds” were actually some sort of moth or butterfly, hovering just about the top of the tree. Unfortunately, they were too far up to get a clear view of them, and I neglected to get an extreme close-up shot (my camera has a 28-560mm lens). After a few minutes rest, we started the hike back to the park entrance. 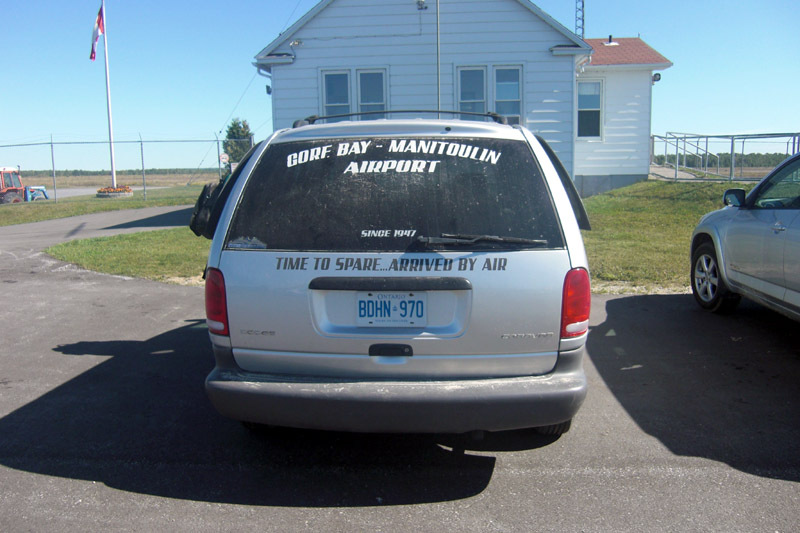 We got to our van, and arrived back at the Gore Bay airport about half an hour earlier than planned. I checked the weather and NOTAMs for our return flight, and called NavCanada to amend our return flight plan with the earlier departure. 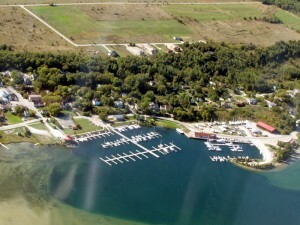 Downtown Gore Bay from the air. 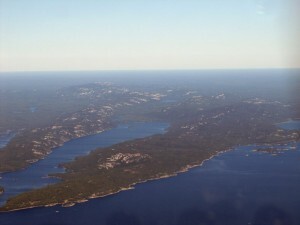 The view from over Fraser Bay. A quarry not far from Killarney. 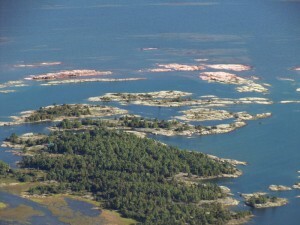 Rugged terrain of northern Georgian Bay. 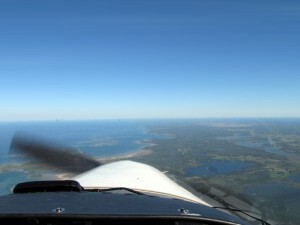 By the time we got close to Parry Sound, we were both getting a little tired. Since we had left Gore Bay half an hour early, and I had already allowed a one hour buffer between our original planned return time and the end of civil twilight (I don’t have a night rating), we had enough time to make an unscheduled stop at the Parry Sound airport. 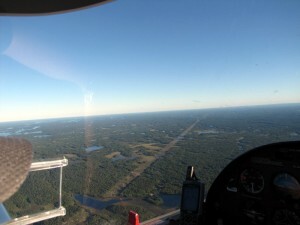 Unlike my last visit there, where I landed in a 15kt crosswind, the air was nearly still and the landing was easy. Hydro right-of-way south of Parry Sound. After landing, we went into the terminal building and had a drink and snack, courtesy of Parry Sound Airport’s after-hours self-service snack bar (and we also ate the chocolate that Elena had brought). Getting rehydrated (and re-chocolated) got rid of that tired feeling, and about 40 minutes later, we were back in the air and headed for home. We arrived back at the Waterloo airport at around 7:30pm, checked in with dispatch, and called it a day. Nothing quite compares with being able to travel somewhere in a small plane. 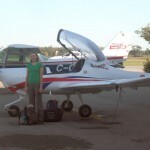 Although there is some additional overhead (especially with a rented aircraft) in preparing for a flight compared to driving, the plane gives you the freedom to go further afield for a day trip than a car would allow, and still with reasonable efficiency (we burned about the same amount of fuel as a car with 9L/100km fuel economy would have used to make the same trip by road).